Capture all the warm flavors of the season! The leaves are changing colors, there are pumpkins all around— fall is in the air! What does the fall season make you think of? For me, I envision the taste of warm apple cider, going apple and pumpkin picking, the sight of beautifully colored leaves, the feel of cool air on my skin, the smell of spices cooking in the kitchen… I absolutely love this time of year on the East Coast! With that said, it was pretty simple to find the inspiration for this next recipe. 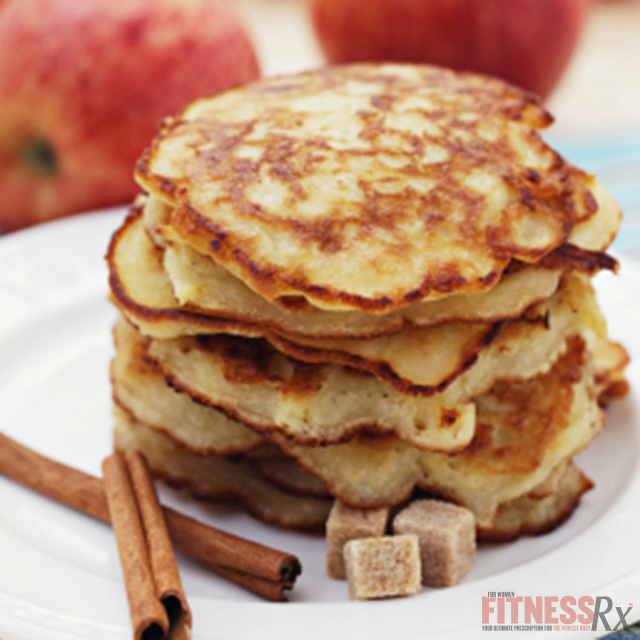 Today I’m bringing you Harvest Apple Spice Pancakes! The hearty texture of these pancakes, combined with the sweet apple and swirled with spices of the season, make this a meal that will just melt your heart. It’s still healthy, you ask? Of course, I wouldn’t have it any other way! If you don’t already know, this is what I am all about. 1. Put ALL (yes, ALL) ingredients in a bowl and mix together until a smooth batter is formed. (Depending upon protein powder used, batter might be thick; if so, add additional water 1 TB at a time until batter is pourable). Set aside. 2. Coat skillet lightly with non-stick cooking spray and place on medium-high heat. Allow to heat up for approximately 30 seconds. (Depending how big your skillet is, you might need to repeat this process to cook all pancakes). 3. Pour batter slowly onto heated skillet to form approximate 3-inch round pancakes. Fit as many as you can at one time so you can eat sooner. 4. Let cook for approximately 2 minutes or until bubbles form on top of pancake and underside is nice and brown. Once this occurs, flip pancakes over and cook for an additional 1-2 minutes or until pancakes are firm and underside is also browned. Stack on a plate. (Repeat this process until all batter is used). 5. Grab a fork and dig in to your stack of pancakes! Are you in love?? Enjoy! Editor’s Note: If you have any specific requests or would like to share your feedback on the above recipes, please e-mail Allison Frahn at AliFrahn@yahoo.com. Allison Frahn is an IFBB Figure Pro and ProSupps athlete. The combination of Allison’s passion for fitness, love for delicious healthy food, and talent for cooking led her to create Alli’s Slim Pickins: 100% Taste, 0% Guilt. Under her brand name, she delivers healthy recipes each week for FitnessRxWomen.com. Allison is also the creator of OPT all natural water flavors. They are 100% FREE of flavors, dyes, or artificial sweeteners and have ZERO calories. Find out more at OptFlavors.com.